We arrived in Port Lincoln to take on some of our most adventurous activities in South Australia. We may not have been pushing ourselves to the limits or huffing and puffing up any mountains, but it was here that we hopped into some of the most daring waters on earth. Everyone always thinks of sharks when swimming in Australia, it's the first thing that everyone mentions when you say you're going in the water. Most people from Oz thought we were crazy to go in the sea here, but we had several excursions planned off the coast. Our first trip took us to Baird Bay for an unforgettable wildlife experience. We were swimming with dolphins! We've swam with dolphins before and it is the most uplifting and beautiful experience on earth. 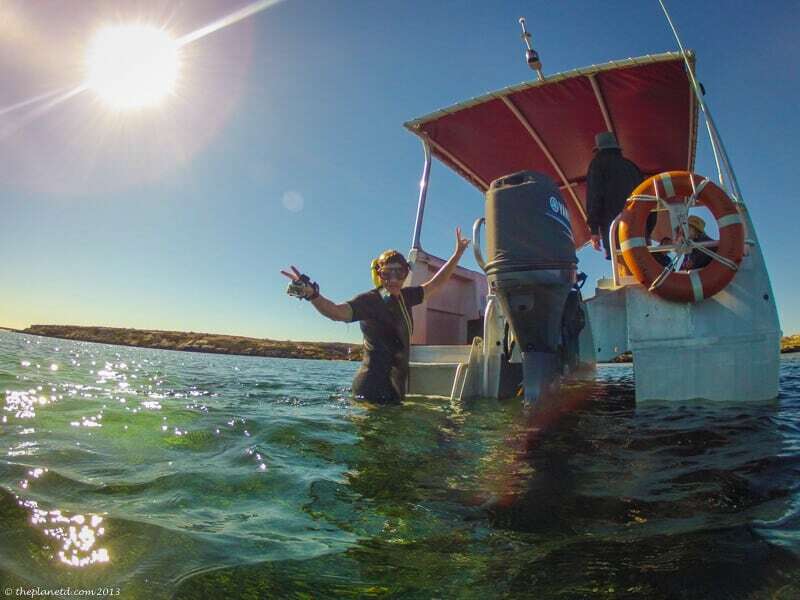 The only difference with swimming in Baird Bay, South Australia was that these waters were in shark territory and they were freezing! When we asked our captain what the temperature of the water was? He replied a chilly 16 degrees Celcius! For you Americans out there, that's 60 degrees Fahrenheit. When we spotted the dolphins and were told to jump in I wasn't sure if I was more afraid of the cold or the possibility of becoming a lunch for a great white shark. We had a quick briefing our swim where we were told stay close to our guide who was wearing a shark deterrent. 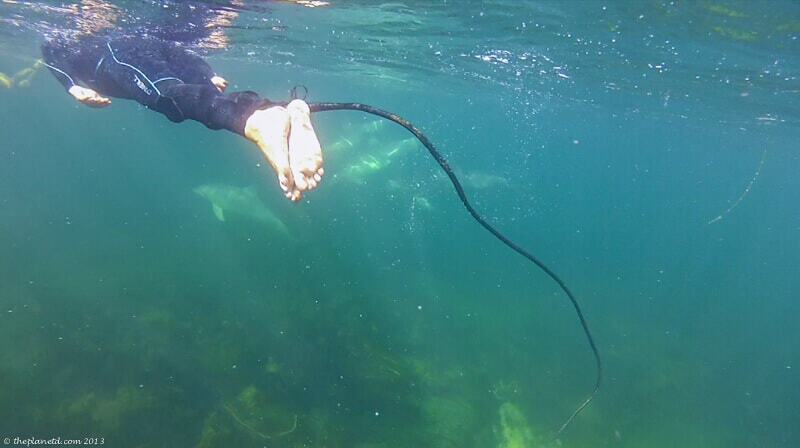 He wore an electronic pulse attached to his ankle that apparently scared sharks off. If we swam too far away we'd be prey. However, the more we thought about it, the more it didn't make sense to us. If sharks and dolphins use the same sonar to navigate, how come it didn't scare off the dolphins? It's better not to think about these things so we just jumped in. Swimming with the dolphins of Baird Bay. Up close and personal. Each time we've swam with dolphins, it's been reiterated that we must jump in as soon as the dolphins arrive. They love to play, but they also have short attention spans and if you don't act soon, you'll miss your chance. So we did what we were told and jumped into the frigid waters. It is said that if there are dolphins around, sharks will not bother you. That is a myth that has been debunked again and again. Dolphins and sharks do share the water and eat the same food but sharks are not terrified of dolphins. They occupy the same space on a regular basis. What dolphins can do is defend themselves against sharks; even Great Whites, and when push comes to shove they can kill a shark while defending their young. When it comes to the food chain in the ocean though, dolphins are up there as worthy opponents. Hey, when we were swimming with dolphins in New Zealand, I saw a shark swim right underneath me. It was big and it was curious, but thankfully nothing happened. Our captain didn't believe me, but we've been up close and personal with enough sharks in our lives to know what they look like. He didn't look afraid at all. See video of us swimming with sharks. Anyway, I'm here to tell the story, so clearly nothing happened… So, on to the dolphins. 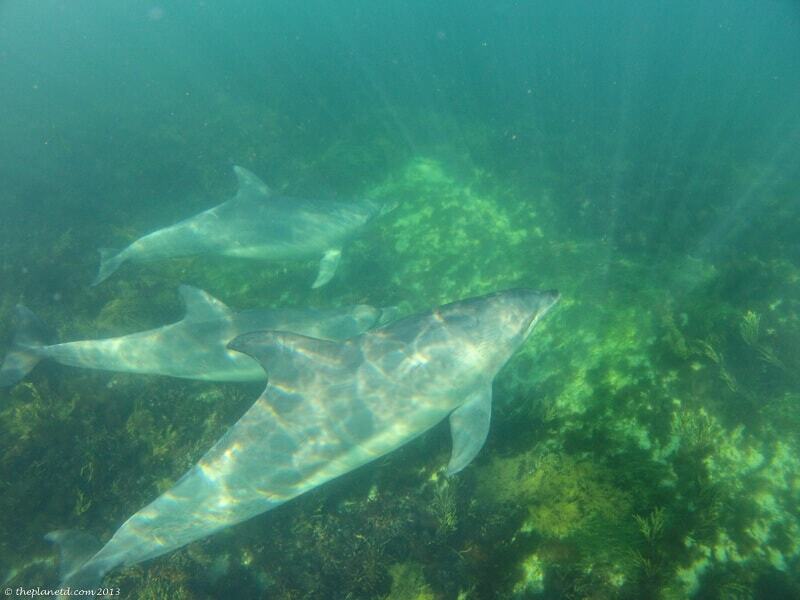 As I said earlier, we've been lucky to have the opportunity to swim with wild dolphins on two occasions. Once in Honduras and once in New Zealand and while they were amazing experiences, neither of these came close to the experience we had in Baird Bay, South Australia. We have never seen dolphins stick around for so long. They made pass after pass around us. They dove and turned and jumped and sang in the water. You can hear their sonar while you are snorkelling. Their eyes are so pure and innocent yet filled with intelligence. When you swim with dolphins, its as if they know your being to the core and can read your mind. I have heard that dolphins and whales can feel your heartbeat and when you are in the water with them, you believe it. You sense that they know exactly what you are thinking. The more relaxed you are and the more you play with them the more they want to interact with you. What I love about the experience in Baird Bay is that it is completely wild. We've never swam with enclosed dolphins before and I don't know if I'd ever want to. Out here in the bay, it is completely left up to the dolphins if they want to play with you. If they don't want to visit, you they'll simply swim away or not show up at all. Both our captain and guide told us that this was one of the best visits they've ever had and we believed them. 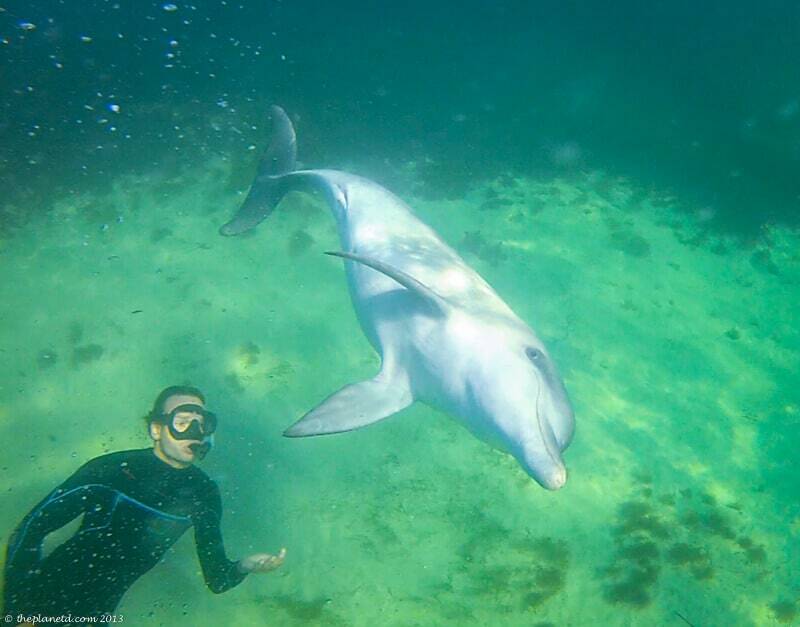 We've never seen dolphins so interested in staying with humans before. They seemed to really enjoy our company and we enjoyed theirs too! 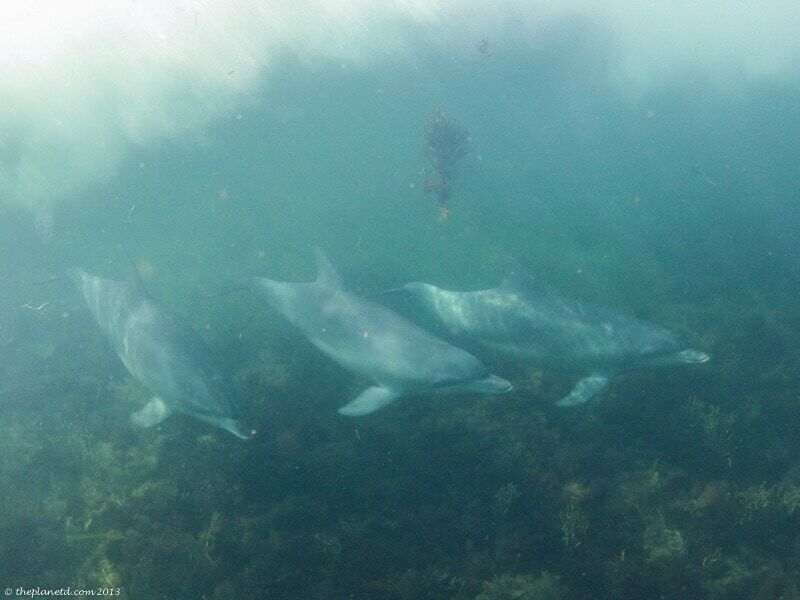 Video from our dolphin swim in New Zealand – South Australia video coming soon. 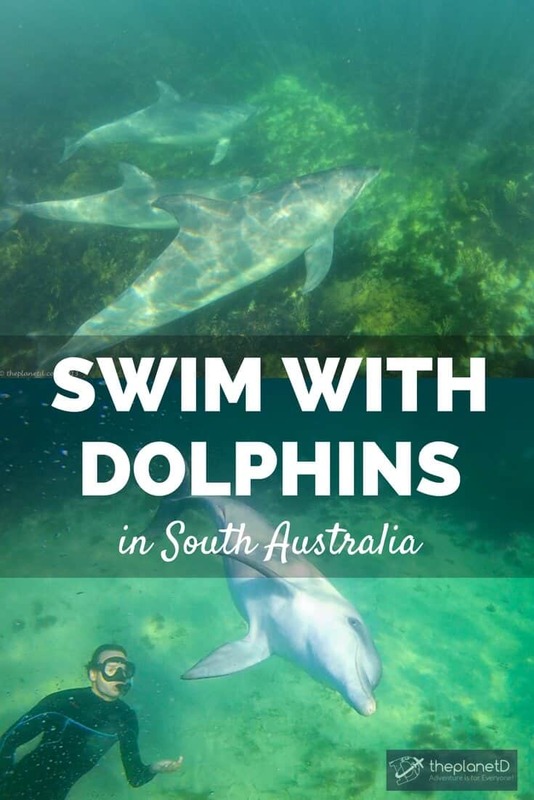 For more information on swimming with dolphins, check out BairdBay.com – Adult swims cost $140 (AUD). To view from the boat with no swim is $100 AUD. Australian Dollar is currently on par with the US Dollar. 28 Responses to "A Dolphin Swim in Shark Country"
Sounds like fun! I feel lucky to experience this often in San Diego. The dolphins come say hi when we’re surfing and on a couple different occassions, they surfed the waves right next to us! It actually surprises me to hear that Austrailians think you’re crazy for going in the water. I thought most of them just went in anyway, considering how many surfers were in the water with us! How cool, we are headed to port Lincoln in September to swim with sea lions! I am a litle freaked out about sharks as sharks LOVE seals!! AHH!!! It seems to have been a wonderful experience and you were very lucky they stayed for so long. As for the your comment about Orcas – well while it is true about them having to eat it is a bit unedifying knowing they sometimes feed on their own kind. It must have been a great experience. Lovely photos. Here in my valley I have not really seen many people swim with dolphins. But dolphins do visit our bay in their hundres. A few times a year Orcas come in and grab a few. I am not sure if you have seen how lions stalk and kill their prey. This is very similar. And not the kind of comment some may want to read here. Hi Johan, thanks for the message. We actually have watched lions stalk their prey, that would be fascinating to watch orcas stalk dolphins. It’s part of nature and orcas need to eat too. Thanks for sharing. During our 2012 Aussie road trip we camped just north of Port Lincoln on the east coast of the Eyre peninsula. After a long day attempting to fix an electrical issue in our motor home we grabbed our snorkelling gear and went down to the deserted shoreline for a swim. We could only have been about 10m from the waters edge, just where the sand meets the green sea grass, when Ben grabbed hold of my ankle and pulled me to the surface. ‘Shark’ he yelled, quickly followed by ‘Swim’ ! I’ve never been so terrified in my life, I think having not seen the creature myself made it worse. As we scrambled onto the rocks I turned and saw a smooth humped back with a fin protruding from the water, I think what he saw was actually a dolphin. Ben is adamant it was Jaw’s cousin!! I went swimming with Whale Sharks last year and it was amazing! Haven’t seen a place as great as what you show here to swim with dolphins. May have to make a small detour soon! You’re right. This must be on every bucket list on earth, but I would not choose to do it in those chilly waters. More power to you and brrrrrr!!! What a great experience! Must’ve been awesome. I hear dolphins are super fun to swim with! Wow, color me jealous. The closest I’ve come to dolphins was feeding them at SeaWorld. There must be something magical about seeing them in the wild. You said it perfecto Marissa. Magical is the word. They are incredible creatures. How amazing! My dream is to one day swim with dolphins. It looks like you guys had a lot of fun. I can’t wait till its my turn one day. I know you’ll have the chance soon Tanya. A decade ago I never thought possible and now here we are! You are going to love it. I love dolphins! My only experience with them, outside of an aquarium, was in Kauai. As we took the boat out to Na Pali, dolphins swam alongside and jumped out of the water, playfully accompanying us on our trip down the coast. However, I would be a little hesitant to jump in the water with them knowing sharks are nearby. I didn’t know dolphins could kill a shark though. That’s pretty cool! You said it. I would hate to force them to have to interact with us. It was meaningful to have it e their choice. Seems like quite the experience! Did you realize the water was as cold as it was when you jumped in, or did the dolphins make you forget? And how long would you say you’d been in the water? Wow. 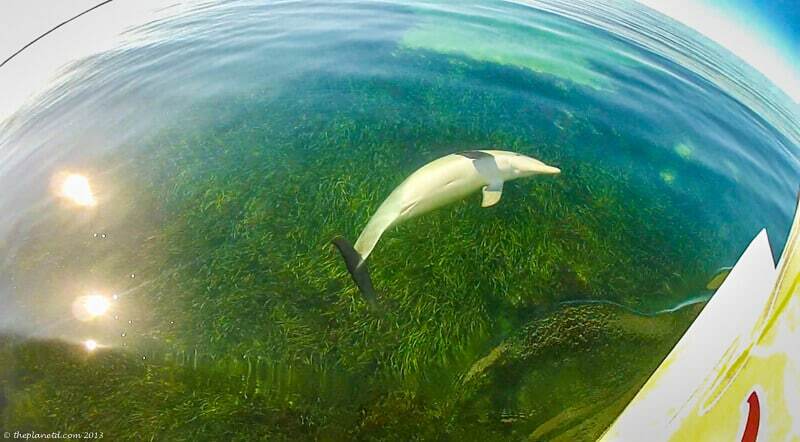 This looks incredible- we still have yet to swim with dolphins. However, we did a significant amount of water based activities in Australia and we lived to tell about it – even with our bull shark encounter! Great story guys! Keep them coming! Ooh! That must have been incredible, yet scary! What happened? Did you write about it anywhere?